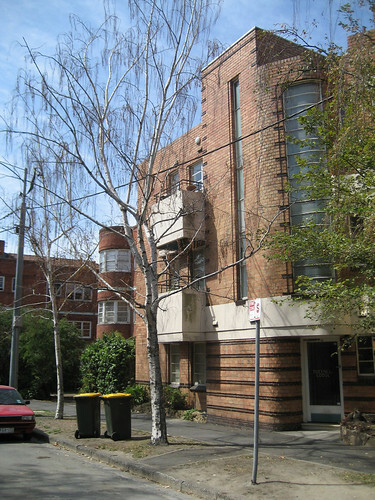 This is one of the blocks of flats in the Art Deco enclave of Garden Avenue in East Melbourne. 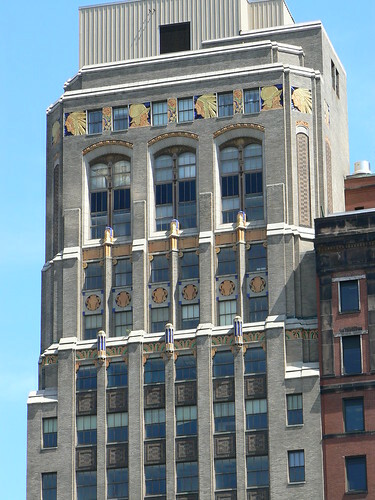 The State Capital of New York, Albany, is the location of this Art Deco bank. 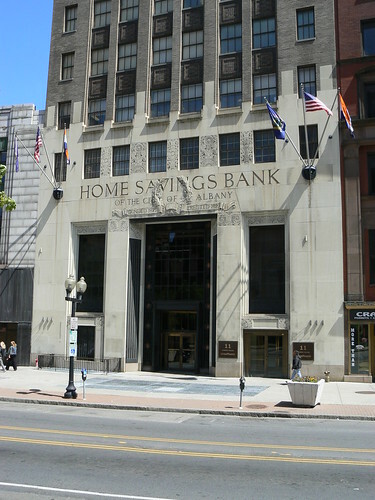 The Home Savings Bank from 1927 was designed by architects Dennison & Hirons. At ground level the main entrance is large and impressive befitting a bank building. 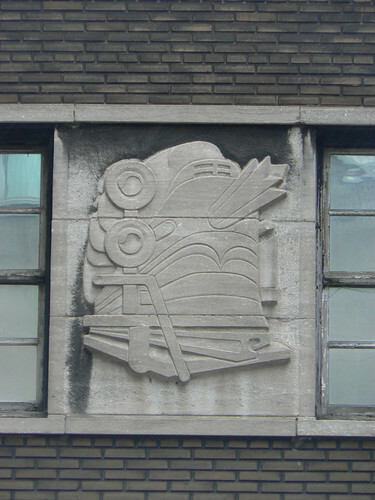 The scroll and wreath above the door recalls an earlier style of decoration but elsewhere on the lower level of the building are pure Art Deco. 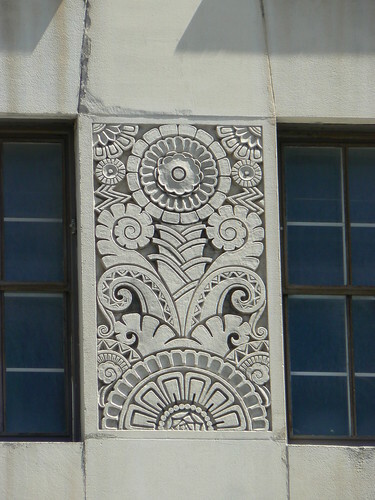 There are several panels like the one shown above with stylised floral forms. 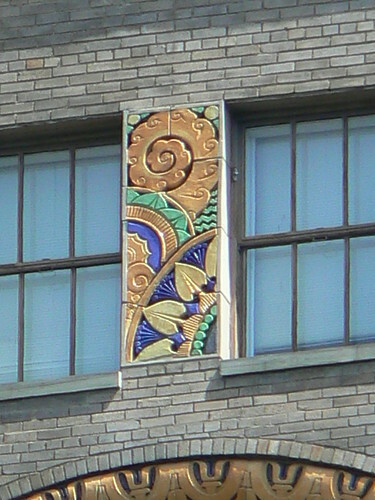 These decorative panels and others on the upper levels were executed by Rene Paul Chambellan who worked on many Art Deco buildings including the Chanin Building in New York City. 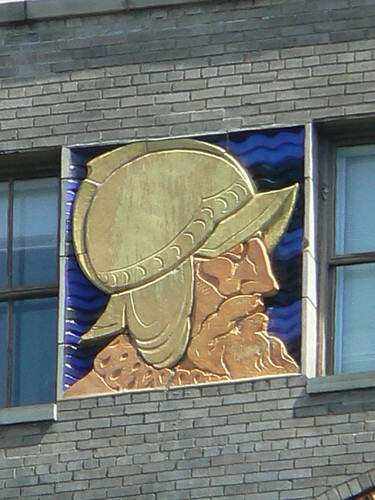 Chambellan's coloured terracotta panels near the top of the Home Savings Bank Building are truly spectacular. They depict a Colonial Settler and a Native American facing each other across a beautifully coloured floral panel. 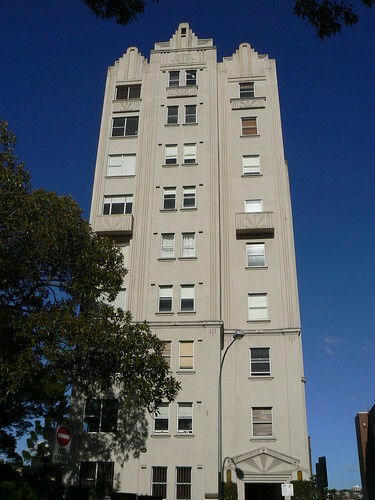 The glorious building is in Elizabeth Bay, Sydney. 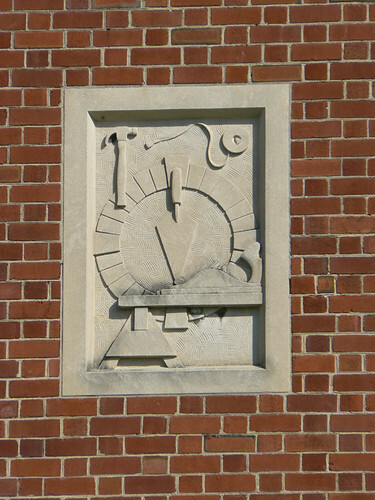 It is Adereham Hall dating from 1934 and designed by Gordon McKinnon & Sons. Often a building will have one sunburst motif, front and centre, on the facade but Adereham Hall has a wonderful geometric Aztec or Mayan 'hieroglyph' instead and sunbursts just about everywhere else. 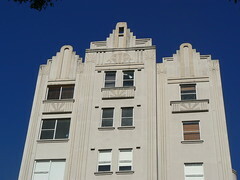 At the top of each column and, in a different style, under each of the three top-floor windows. 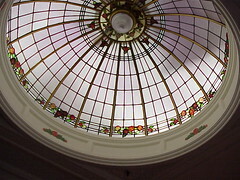 The later style sunburst is then repeated above the main entrance. 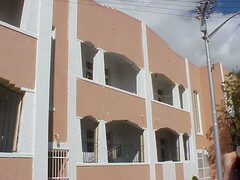 It makes another appearance under each of the two small balconies half-way up the building. 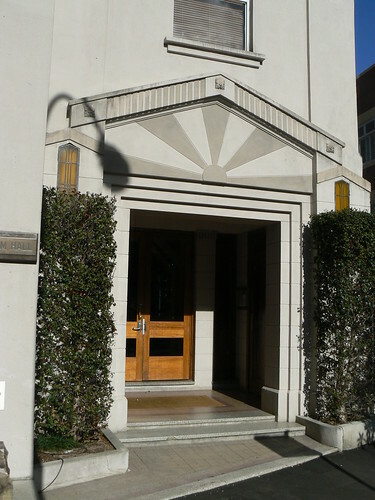 Elizabeth Bay and Potts Point are wonderful areas of Sydney to explore and admire Art Deco buildings, many of which are included on this walking tour of the area. 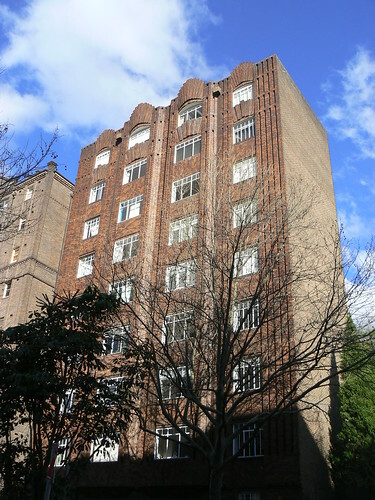 Wychbury is an impressive block of flats in the Sydney suburb of Potts Point. 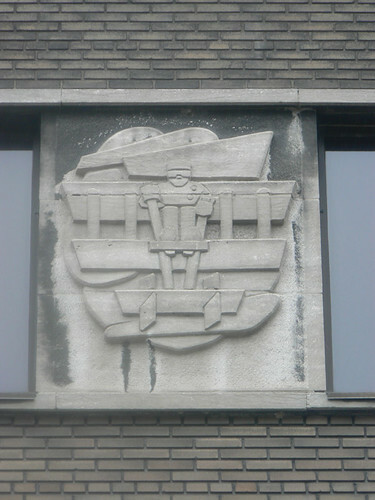 It was designed by Emil Sodersen and completed in 1934. 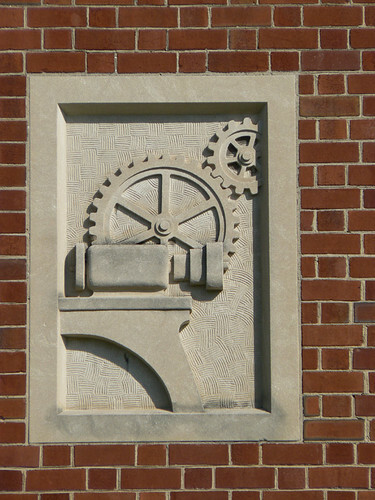 The use of brick as a means of decoration on Wychbury is astounding. 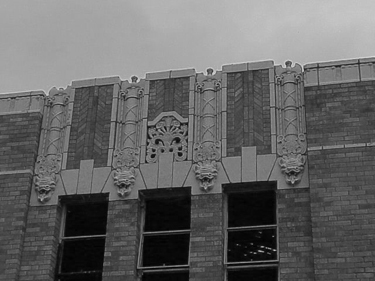 I really like the scalloped roofline and the subtle differences in scale between the two inner columns and windows the outer ones. It must have been a bricklayers nightmare. Each time I look at the building I see another variation in the brickwork. 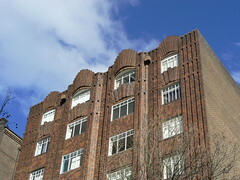 Look as the chevron pattern below the second top row of windows and the vertical lines of recessed bricks on the outer edges of the building creating deep shadows under the Australian sunshine. At street level, around the main entrance the brickwork, if anything, has increased with a series of steps below each of the windows and then further stepping to the recessed doorway. 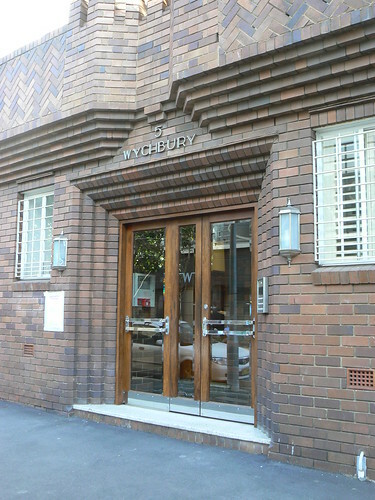 Wychbury just shows what can be done with the humble brick and they didn't even use contrasting colours. This is an interesting store in Hindley Street, Adelaide. 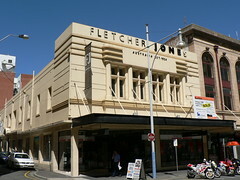 Obviously it is now a Fletcher Jones store, a company which has it's origins in the western district of Victoria in the years between the wars. The Fletcher Jones website reports that having established stores in Warrnambool and Hamilton in 1924, the company expanded to have a store in Collins St, Melbourne in 1946 with stores in Adelaide, Sydney and Hobart between 1949 and 1952. That Adelaide store may have been this one however the style of the building looks earlier than 1949 to me and Fletcher Jones may have taken over an exisiting premises. Perhaps one of my Adelaide friends knows a bit more about this handsome shop. 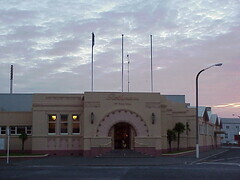 Probably the most decorative Art Deco building in the Napier area is this former tobacco company building in Ahuriri. 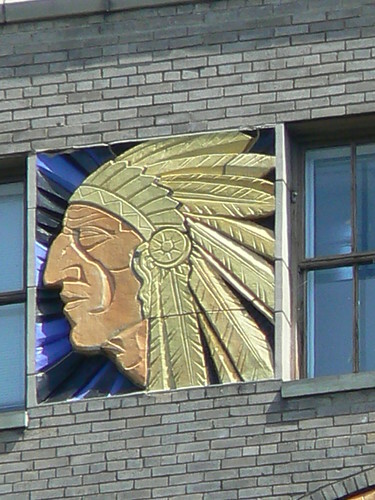 Dating from 1932-33, it was designed by Louis Hay for the National Tobacco Company. At some point it was taken over by the Rothmans of Pall Mall and therefore my photos from 1999 show the building bearing that company's name. 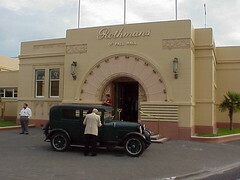 Since then, Rothmans are no longer using the building and the National Tobacco Company name has been restored to the front of building. 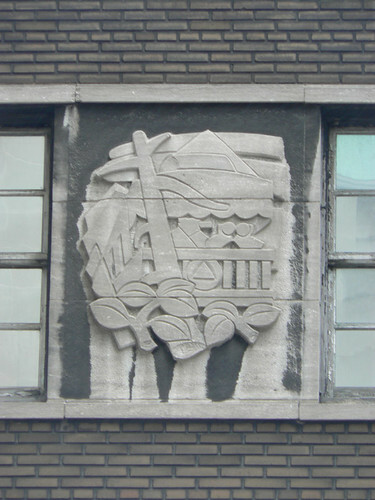 Hay designed the building as a series of receding rectangular forms countered by 14 Art Nouveau style rose stems arranged in a semi-circle around the main entrance. 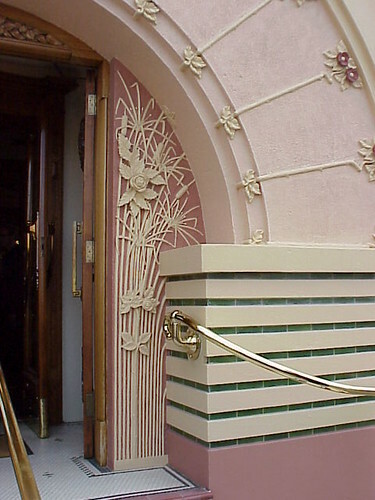 The space either side of the door is filled with sculpted flowers and a local New Zealand variety of bullrushes known as Raupo. 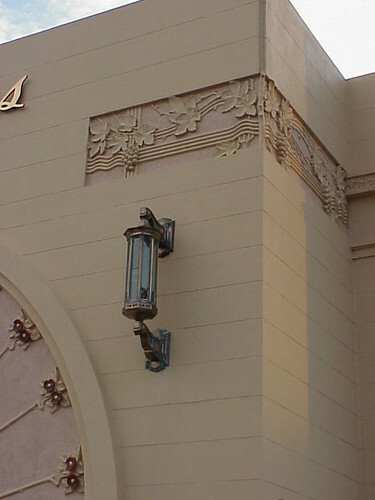 Other decoration on the facade includes a pair of lamps with a small leadlight rose included at the bottom of the galss panel and a rectangular panel with stylised grapevines that wraps around the corner of the building. 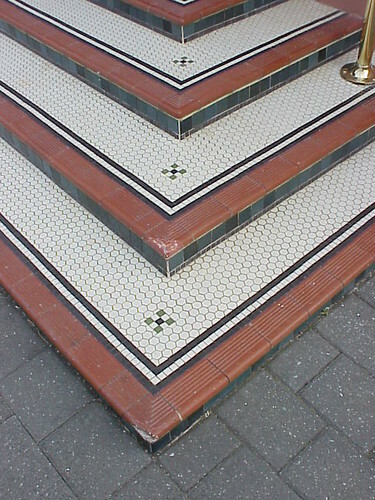 Even the tiled steps leading into the building are very decorative. 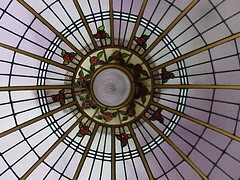 The floral theme is continued inside the building with roses in the leadlight glass of the large domed skylight. Roses, combined with oranges, again feature in the leadlight windows of the office. 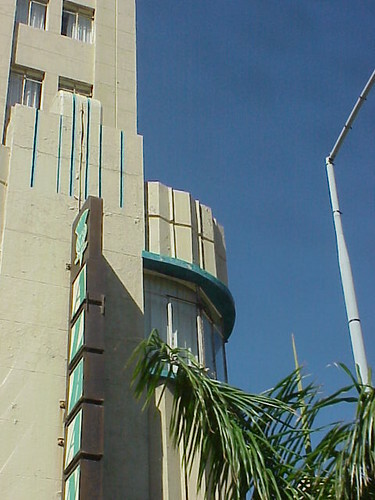 The interior woodwork includes small stepped art deco elements that are indicitive of the detailled attention given by Hay to this extraordinary building. 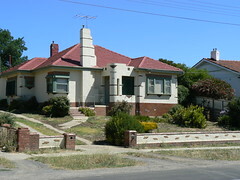 This fabulous house, Seddon, is in the rural Victorian city of Castlemaine. I like the combination of the stepped chimney and the entry porch. The narrow lines of bricks on each bring these two features together. 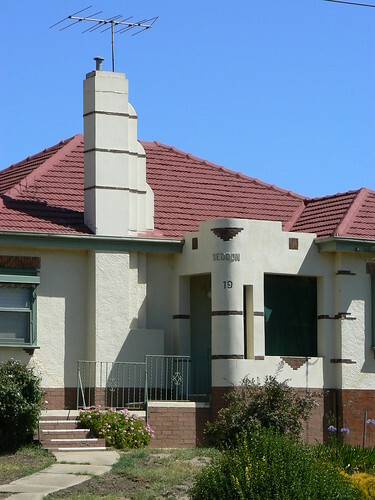 The contrasting bricks are also used as decorative elements on the corners of the house, below the windows and in the low wall at the front of the property. 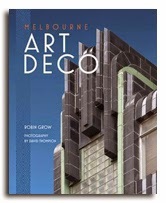 Alas this is another of those Art Deco buildings snapped in a strange city and I know very little about it. I know that the photo was taken on one of our bus tours during the 2003 World Congress on Art Deco in Cape Tour. From the sequence of photos I suspect it is in the 'lower foothills' of Vredehoek or at least on the way there. 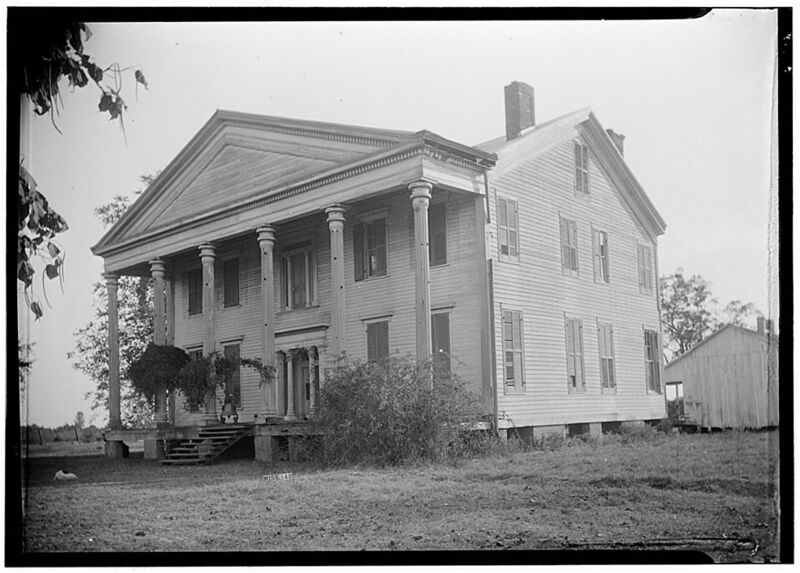 Feel free to leave a comment if you know this building and can help identify its location. 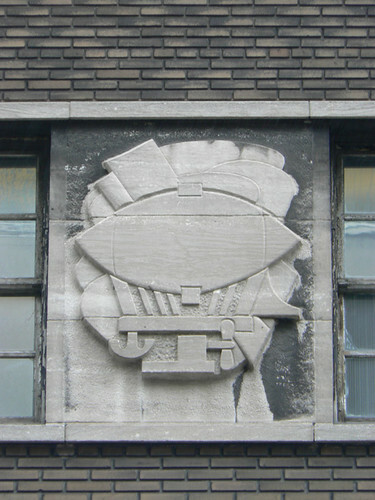 The large murals by Charles Comfort inside Montreal's Gare Centrale are unmissable to all but the most urgent of travellers passing through the ticket hall. 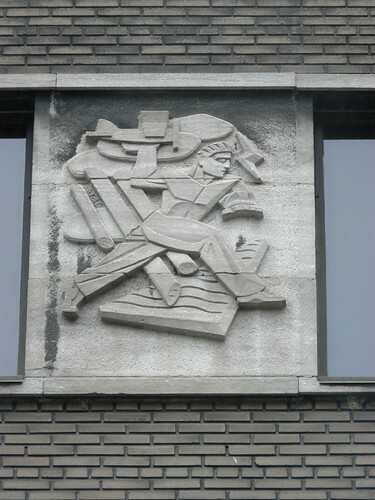 Outside, however, there are a series of friezes executed by Fritz Brandtner that are too often overlooked. They depict various aspects of transport through the ages including hot air balloons, planes, trains and a fantastic rendering of Icarus flying too close to the sun. As you can see from the final picture, some of the reliefs have been severely compromised and, no doubt, have been removed or hidden by subsequent extensions to the railway station. 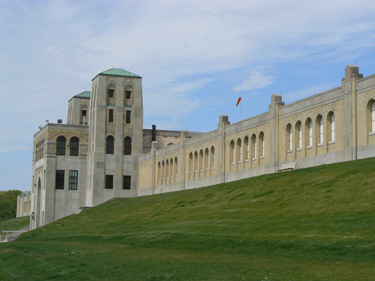 The R C Harris Filtration Plant takes water from Lake Ontario and processes potable water for Toronto. 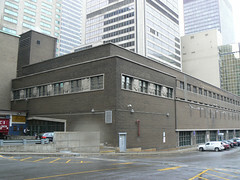 The building was named for Rowland Caldwell Harris, Commissioner of Works for the Toronto 1912-1945. 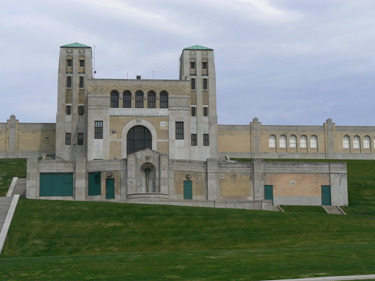 It was built from 1932-1941 and the original plant and additions in the 1950s to increase the capacity were designed by and the construction was supervised by the consulting engineering firms of H G Acres Limited and Gore and Storrie Limited. 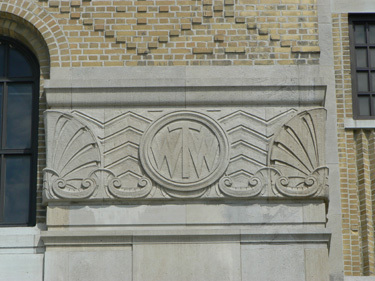 For a water filtration plant, it has some very nice decoration including this 'WTW' monogram. 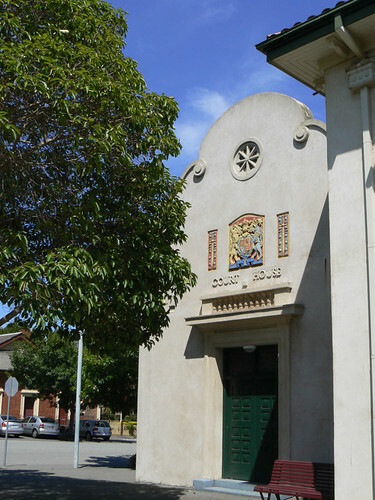 I reckon there isn't that much Spanish Mission style Art Deco architecture Melbourne. 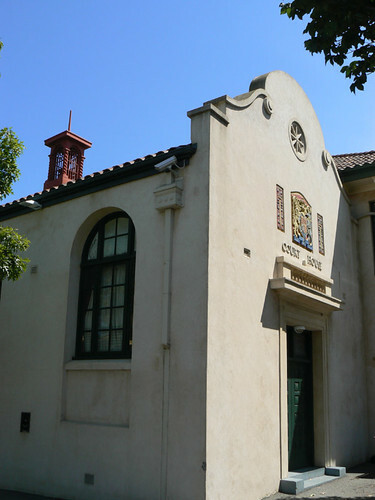 Mostly I see it in houses but the South Melbourne Police and Court Complex is a very rare public buildings in that style. 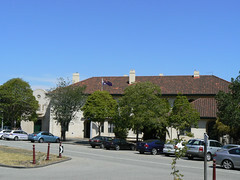 They are acknowledged as such by Heritage Victoria. 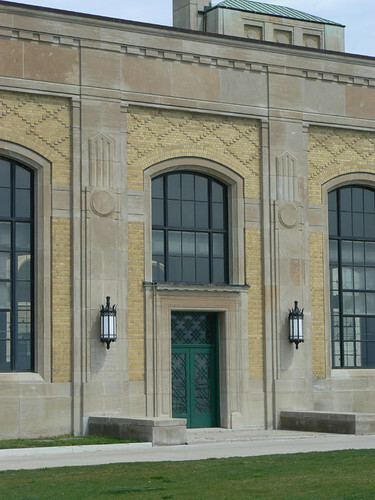 The buildings were designed by the Public Works Department architect E Evan Smith and built in 1928. 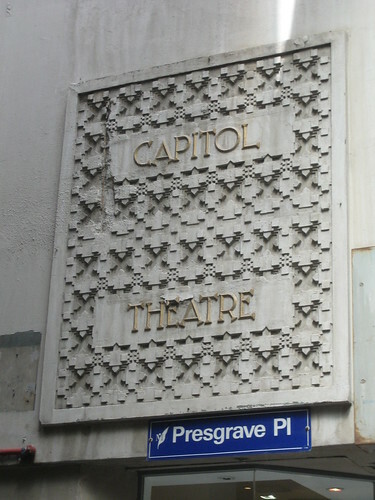 This concrete sign is on a laneway wall at the back of the Capitol Theatre designed by Walter Burley Griffin & Marion Mahony Griffin and openned in 1924. Today the theatre is owned by RMIT University who use it for lectures and other functions. Colonial First State Management Company and Myer have started their demolition of Lonsdale House this morning. Katya has posted a photo on her Bosco Parrasio blog. There is a community protest planned for 6pm tonight at Lonsdale House to voice community anger over Colonial First State Management Company, Myer, the City of Melbourne, Planning Minister Justin Madden and the State Government to allowing this iconic building to be obliterated from our city. 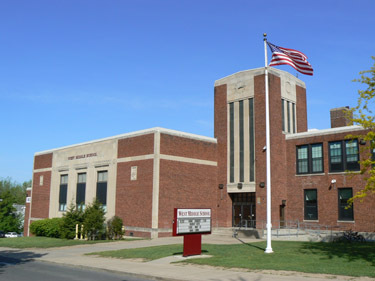 Found this fantastic little middle school in Auburn, NY. 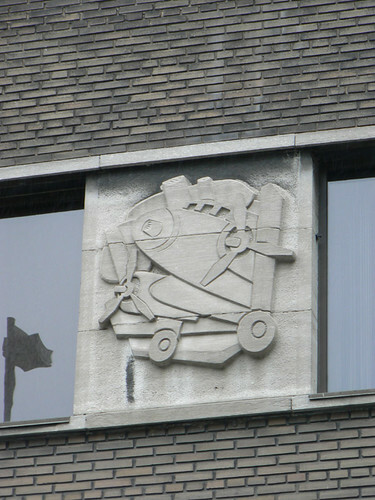 There are two decorative panels, one on each side of the set of three windows in the left section of the building, depicting cogs, a lathe, hammer, a plane, a trowell and a measuring tape. 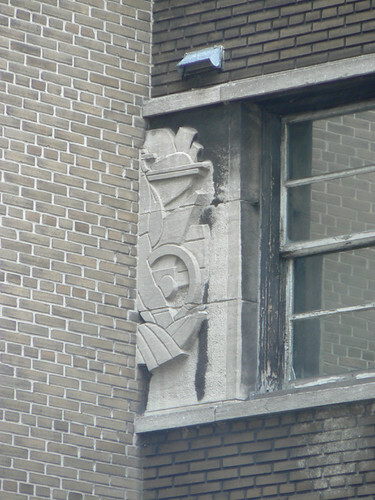 Perhaps the building was originally a trade school. 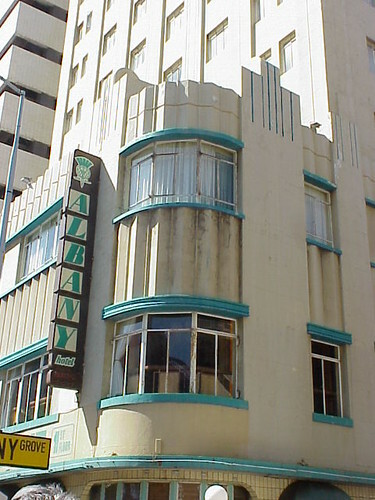 This is the Albany Hotel in Durban. 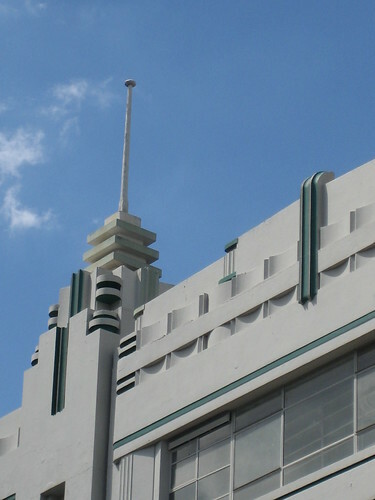 An interesting item came through my inbox this weekend that an Art Deco Museum is being planned for Tulsa. It is known as Decopolis and at this stage exists only as a website, decopolis.org, with a fundraiser planned for February this year. 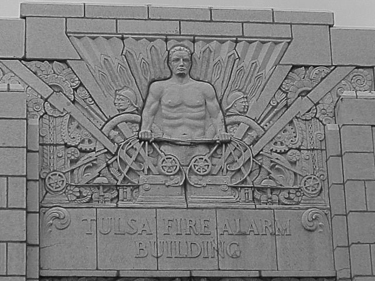 Tulsa has a great stock of interwar architecture and one of the best Art Deco building is Tulsa is the Fire Alarm Building. It is also one of my least successful photographic efforts. I don't know if I accidently adjusted the white balance on my camera or whether it was just playing up. I any case, the photos were a horrible washed out blue colour and I've only just salvaged these examples by converting them to B&W. You'll also notice that when I visited in 2001, this fine (and now listed) building was in a bad state of repair, fenced off with the windows boarded up. 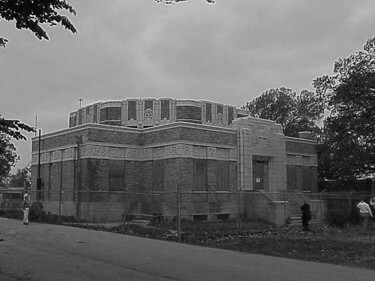 Luckily Tulsa Gentleman and the Tulsa Preservation Commission have posted better and more recent photos on their sites. 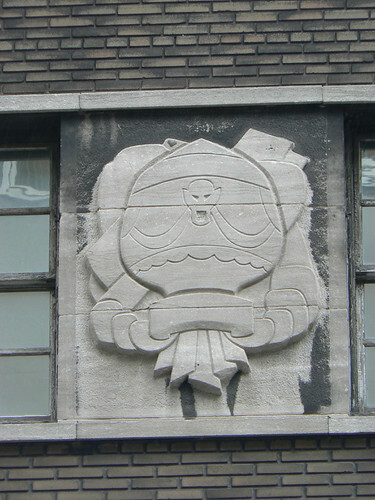 The Fire Alarm Building was designed by Frederick V Kershner along the lines of a Mayan Temple. 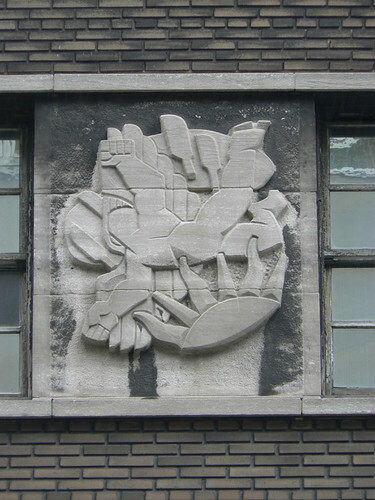 The decoration around the sides of the building feature stylised floral forms and dragon's heads. 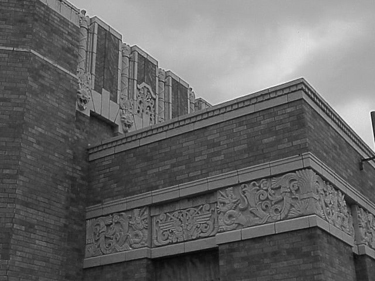 However, the frieze above the door is the buildings crowning glory. I hope you can see, even from my photos, that this is a stunning piece of art. 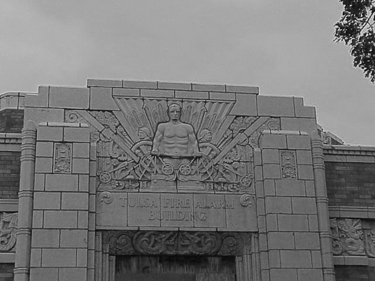 Best of luck to the people working to establish the Tulsa Art Deco Museum and when completed will further enhance Tulsa's deco credentials.